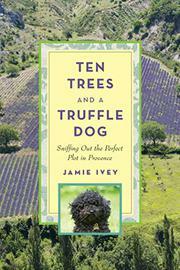 Delectable account of how an ex-lawyer took up truffle hunting in Provence after fleeing the drudgery of an office job in England. Ivey and his wife left London “determined to experience a better quality of life” in rural France. Together, they built a wine business and dreamed of the seemingly impossible: owning a home in a place where only rich Parisians and celebrities like “Brad and Angelina” could even consider buying property. After a real estate agent showed them an affordable piece of land that came with its own oak tree truffle patch, the couple knew they had come home at last. The cat-loving Ivey then began his search for a “hypoallergenic” canine that he could train to be a champion truffle sniffer and good family pet. That quest led him to Snuffle, a petit chien lion puppy that his wife was convinced looked more like a rug than a dog. As Ivey and his equally cat-loving wife began to adjust to life as canine owners, they faced a string of house-building challenges, from financing to construction, since both were outsiders to the closed world of the Provençaux. Even Snuffle seemed reluctant to cooperate when his master began training him to become a truffle dog. The more Ivey became involved in the hunt for “black diamonds,” the more he bore witness to the back-stabbing, secretive and sometimes even deadly world of trufficulture. Despite the many frustrations and frequent encounters with sometimes-bewildering behaviors and customs, Ivey and his wife both emerged wiser about human nature and happily endowed with a home and truffles to spare. Good fun for gastronomists and travel buffs alike.